Track your time, manage projects, and send invoices faster and more efficiently with RemoteOne. We make managing remote businesses more productive for freelancers, entrepreneurs and digital nomads. Stop losing money because your projects overrun and your admin takes too much time. 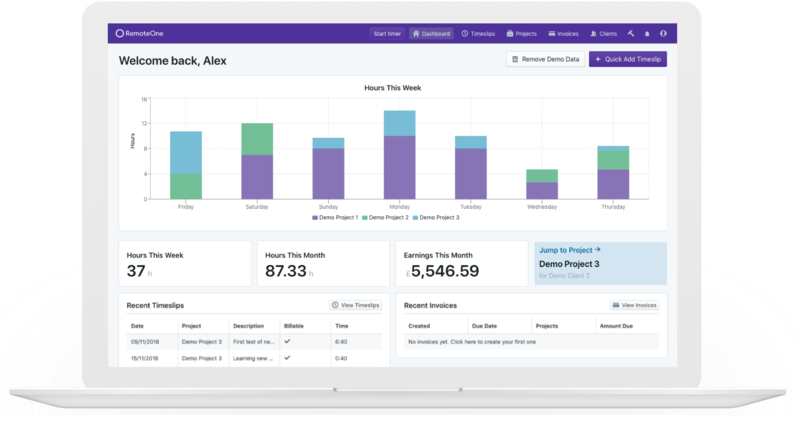 With RemoteOne you can track project times and budgets, send one-click reports and get paid fast with automated invoices. Time tracking made easy. So you spend less time on admin and more doing the things you love. Get paid with stunning invoices. Save time with invoices that add unbilled time slips automatically. 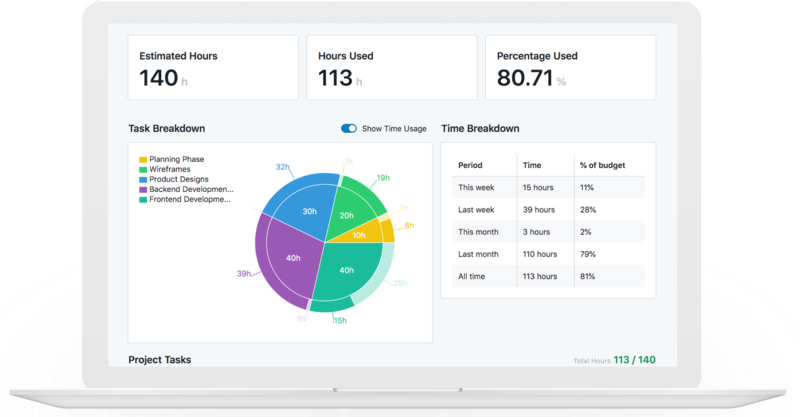 Our project dashboards provide your clients with real-time progress updates, building trust through transparency. Freelancing isn’t easy and you need the right tools for the job. Ditch the speadsheets and start structuring your time with RemoteOne today. Get a break down of your projects, clients and tasks. See where you're wasting time and see what makes you money. Provide more accountability and visibility to your remote clients with a real-time dashboard and one-click reporting. Effortlessly update your clients in real-time or easily provide the detail they need on your own terms. Forget scheduling errors and currency conversions fails. RemoteOne calculates time differences and converts currencies so you don't have to. 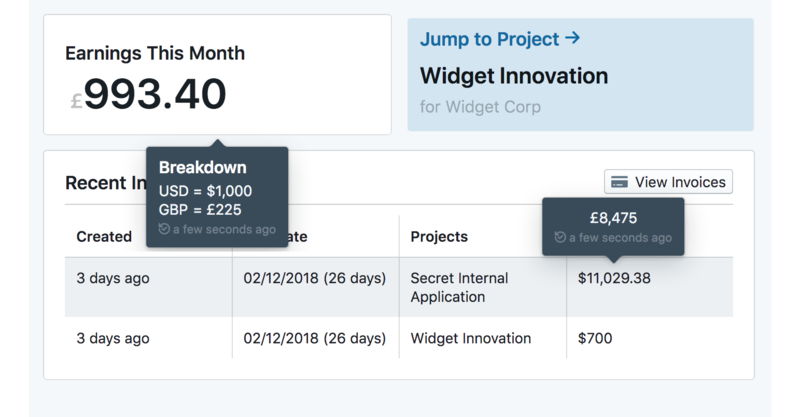 I’m just getting started with my consulting side business, and I’ve found RemoteOne to be a great tool for keeping track of how much time I spend working on client projects. No more pen and paper either - just track and invoice. It’s seamless. I’ve been managing my remote clients for a while, always guestimating if I’m making money and how much time I spend on each project. Well I finally got my business together, started using RemoteOne to track all my projects and now I’m finally able to expand the business and start hiring other people. With RemoteOne I finally found an online software where I could unify all management as a freelancer: from time-tracking, project management, and an invoice generator. All this combined with great on-boarding and easy navigation. A must-have freelancer tool. Try before you buy. Your first month is completely free so you can see if RemoteOne is the right choice for you. We’re so confident that you’ll love RemoteOne that we’re offering a 60-day money back guarantee. Any reason, no questions asked. Our no-onligation plans mean that you can swtich or cancel any time with no strings attached.